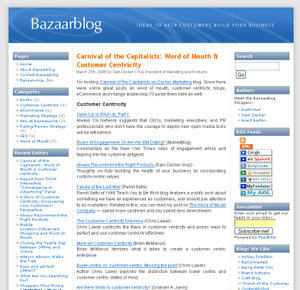 We just relaunched our new Bazaarblog. 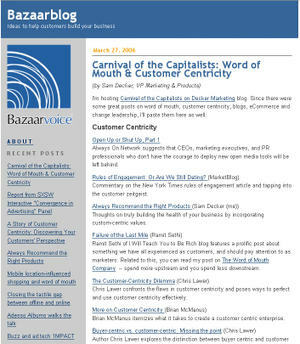 I wouldn’t normally post Bazaarvoice-related topics here, but you may find this useful and interesting as you think about your blog features and design. I solicited the help of ContentRobot, who responded to my Craigslist request for blog help. Thank you CraigsList! They were great. Fast, professional, capable, knowledgeable. And unlike many, many designers and developers I’ve worked with in my career…they got it almost entirely right the first time! It’s one of thos magic times where things click! Our first blog launched on TypePad, which is a great platform. But we heard good things about WordPress and its plugins, so I thought this would be a good learning experience to put our Bazaarvoice blog there. My objectives were to move the blog to WordPress, move it to bazaarblog.com domain, improve search engine optimization, add RSS feeds, FeedBlitz subscription, search, categories, archives, tagging capability, authorship credit (we have three authors), post summaries, and put it all in a new design that fits in but is not a clone of our corporate site. Occasionally I run across great products, services and companies worthy of proactive word of mouth. ContentRobot is such a company. I’m very pleased with the outcome. What do you think? Hi Sam: Thanks for the recommendation. I have a couple of thoughts on the go that may need a service like this. Cheers. Yes, the new layout is better, much better! Good job! Very nice work,You are doing great job! Very good site. You are doing great job. Please Keep it up….! Yo have nice site, admin! keep up good work man! I love you so much! Great place to visit! Very nice design 😉 Good work,webmaster! Very good site, greate content !! Good work, webmaster! Nice site! I think you did a good job. I’m a little bit surprised that you moved from Typepad to WordPress). Free software is on the wave, and i think it’s not bad! Good luck! © 2006 Decker Marketing. All rights reserved.